One set into his quarterfinal match with No. 8 seed Marinko Matesevic, top-seeded, John Isner looked like he was ready to throw in the towel. With the temperature approaching 90 degrees and dew point in the mid-60s, Isner was moving slowly in between points and bending over and gasping for his breath after long rallies. If you've watched John Isner play tennis the last seven years, you know this is when he is at his best. Despite the scorching conditions, Isner put Matosevic away winning 6-4,7-5 Friday afternoon. "I knew he was struggling out there, and he knew I was struggling out there, a little bit," Isner admitted after the match. "Even though I appear to be super tired, I can muster up enough energy to pop some big serves." How hot was it out there, John? "At the beginning of the second set, it felt like someone put us both in the oven," laughed Isner. It may have been hot, but Isner said not as hot as it was at the 2010 edition of this event. 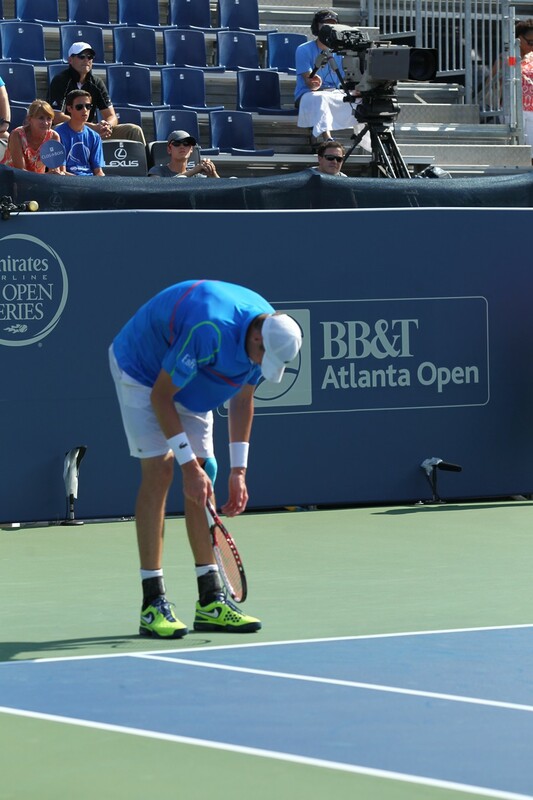 In fact, Isner plays well in the heat, even if some of his critics say he is a bit dramatic while on the court. "A lot of people tell me I play possum out there, and I may be doing that, but I'm not breaking the rules by any means," added Isner. "When I'm super tired I play my best tennis- I go for it." Isner finished early in the afternoon, so that meant plenty of time in the evening to spend time with, and walk his dog, Magill. "I will (walk my dog), last night I went to bed at 1:30, but it will be a normal time tonight. I'll walk the dog (and) that will put me at ease." Next up for Isner will be his frequent practice partner at Saddlebrook in Florida, Jack Sock. Sock survived an early deficit to Lukas Lacko in his quarterfinal, but came out on top with a 7-6 (6), 6-2 victory. The first break Sock earned in the opening set seemed to propel him to victory. 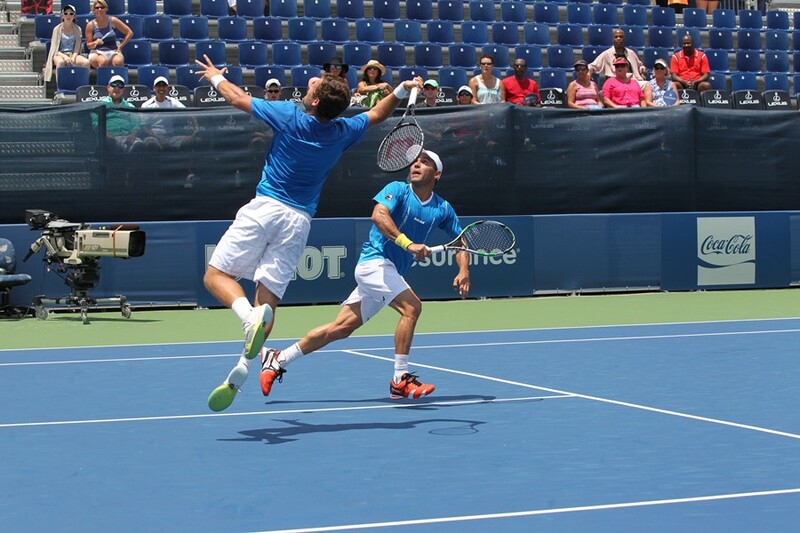 Nicolas Barrientos and Victor Esterlla defeated Chris Guccione and John-Patrick Smith Friday afternoon. Sock had only six aces, but converted on all four break points he had to close out a fading Lacko. The other semifinal sport will go to Benjamin Becker, a 33-year old journeyman on the ATP World Tour that reached a final earlier this summer at ‘s-Hertogenbosch. Becker admits he's in the latter stages of his career, so every chance he has to reach a final is important. "I'm feeling well, I'm playing well. The start of the year wasn't what I had planned. Once you play a final it gives you confidence,” Benjamin said. In the day's doubles action, the American duo of Steve Johnson and Sam Querrey edged Santiago Gonzalez and Scott Lipsky, 7-6 (2), 7-5. The other semifinal berth went to Nicolas Barrientos and Victor Estrella Burgos as they defeated Chris Guccione and John Patrick-Smith.